Last July 20 was the sixth City of Water Day in New York City. Presented by the Metropolitan Waterfront Alliance, an alliance of over 700 organizations with ties to regional waterways who are working to transform the waters of New York and New Jersey Harbor into clean and accessible places to learn, work and play, with inviting parks, dependable jobs and reliable, eco-friendly transportation for all. MWA’s City of Water Day Festival is a free day-long celebration of the world-class potential of the water that surrounds us and brings us together. Held on Governors Island and Liberty State Park in NJ--the event draws thousands of people from throughout the NY-NJ metropolitan region to participate in hundreds of unique, fun, and educational waterfront activities organized by MWA and its 700 Alliance Partners. This year's celebration included free public kayaking and rowing, fishing demonstations and some hands-on waterfront activities for kids. The highlight of the festivities, for me, were the free boat tours on historic and educational vessels. The different vessels had limited passengers and I was lucky to get tickets to two of the boat tours. My first ticket was in the morning aboard the yacht the Marco Polo Jewel. Climb aboard the Marco Polo Jewel, a glorious 120-foot yacht boasting two sprawling outdoor decks, for a scenic river cruise up the Hudson. The Jewel will sail north up the Hudson to the George Washington Bridge then return to West Harlem Piers. From the yacht i could see the 125th Street part of the Cherry Walk, I've walked along these 25 blocks of continuous walking path along the Hudson River Greenway in the spring. The path is planted with cherry trees, a gift of Japan to the people of New York City. I could also see the bell tower of the Riverside Church, as well as the top of the General Grant National Memorial. When you walk around Morningside Heights, you'll see these beautiful structures up close. Pretty soon, the Little Red Lighthouse came into view. There it is, a beauty in red under the George Washington Bridge. The yacht didn't stay long, it already started to turn before we came near the George Washington Bridge. Still, being in the middle of the Hudson River gave us a great view of the bridge. The hour passed quickly, pretty soon we were docking back at the West Harlem Piers. I declined the offer of food and drinks as I wanted to be early at Governors Island where my afternoon trip will depart from. On my way to the Battery Maritime Building which houses the ferry to Governors Island, I passed by Water Street and saw that part of the street has been cordoned off, the area displaying a large sand castle. It even comes with a warning sign. Then I'm at the ferry on my way to Governors Island.The Soissons landing now sports the island's name in big letters. Much of the island's south end is currently undergoing construction. There is a sort of viewing deck at the Liggett Arch where you could monitor the project. 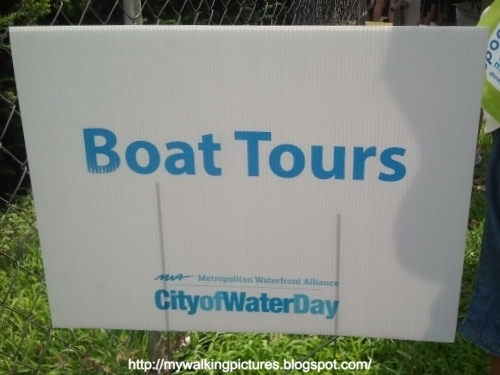 There were also some exhibits on the island in relation to the City of Water day festivities. Then it was time to board the NY Waterway Ferry for the Harborside Memorial Tour. It was a hot summer day, I could see the haze looking out at lower Manhattan and Governors Island. We passed along Buttermilk Channel, our tour guide pointed out the Snapple factory. One of the memorials our tour guide mentioned was the Tear Drop Memorial in Bayonne, New Jersey. It is an official gift of the Russian government as a memorial to the victims of the September 11 attacks and the 1993 World Trade Center bombing. We were too far to take a closer look but this was what it looks like from where we were at the New York harbor. The wiki link above has a great pic of the memorial. After the Tear Drop Memorial, Lady Liberty came in sight. She reopened just last 4th of July after hurricane Sandy damaged most of its brick walkways. There she is, always holding that beacon of hope for all the world to see. After our boat left the Statue of Liberty area, I looked back and saw the sun's rays shining down on the statue. It looked like the heavens were pouring out their blessings on her and the tired, the poor and the huddled masses. Next to Liberty Island, we passed by Ellis Island, the former gateway for millions of immigrants to the United States from 1892 until 1954. Like Liberty Island, Ellis Island was heavily damaged by hurricane Sandy and is still closed to the public. Then we were heading towards lower Manhattan. The skycrapers looked so colorful when viewed from the New York harbor. Battery Park City has a lot of memorials. When I was walking there at the end of last Winter, I passed by the Irish Hunger Memorial, the New York Police Memorial and tried to see the single panel of Berlin Wall on display at the Kowsky Plaza but the area was cordoned off for repairs at that time. Battery Park City also houses the Museum of Jewish Heritage, which was created as a living memorial to those who perished during the Holocaust. The memorial is housed in the low buildings at the foreground of the pic below. Then there is the National September 11 Memorial. The National September 11 Memorial & Museum is the principal memorial and museum commemorating the September 11 attacks of 2001, which killed nearly 3,000 people, and the World Trade Center bombing of 1993, which killed six. The memorial is located at the World Trade Center site, on the former location of the Twin Towers, which were destroyed during the attacks. The memorial can't be seen from the river as it consists of two pools which was the former site of the Twin Towers but One World Trade Center, which rose from the ashes of Ground Zero, is now standing proudly over the site. Standing at 1,776 feet, it is now the tallest building in the Western Hemisphere. We then passed by Pier A, the 127-year-old former home of the harbor police. From the river, it looks like the restoration work is nearly finished but it seems the outdoor public plaza has hit a snag. From the New York Harbor, I can also see the pylons of the East Coast Memorial in Battery Park. The memorial commemorates the U.S. servicemen who died in the coastal waters of the western Atlantic Ocean during World War II. There are a total of 4,609 names inscribed on both sides of the eight 19-foot tall granite pylons. Battery Park has a lot of memorials. I've covered some of them during my walk there on Veterans Day last year. 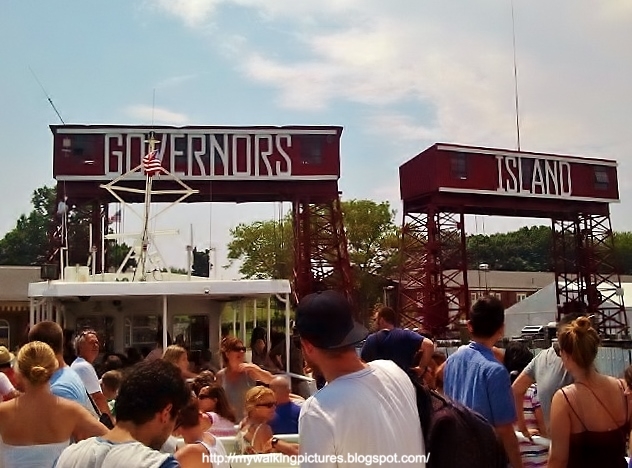 By then our time was up and we have to go back to Governors Island. We passed by the Staten Island Ferry Terminal and the historic Battery Maritime Building which is used by the Governors Island Ferry. We also passed by the Brooklyn and Manhattan bridges, two of the three bridges connecting Brooklyn with lower Manhattan. One last pic of lower Manhattan and then we were heading back to Governors Island. After the boat tour, I walked around Governors Island again, this time at its east side. I saw the new public art by Figment entitled Head in the Clouds. Head in the Clouds offers visitors the chance to walk into the clouds, experiencing them from the inside out. Clouds are collections of water and movement that seem to form animals, people, and cities by dreamers gazing at the sky. I also saw the Tree House, a Figment project which has returned to the island for the third year. Both kids and adults love it! 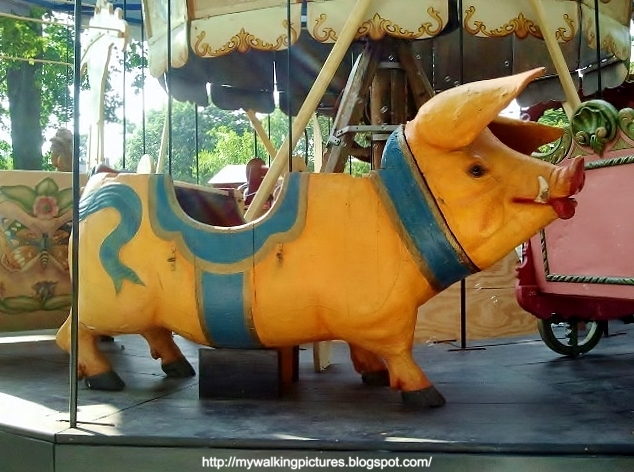 When I crossed over to Nolan Park, I was amazed as the area was filled with vintage rides, mostly carousels. Turns out Fête Paradiso, the world’s first traveling festival of vintage carnival rides and carousels, is making its American debut on Governors Island. This cute ride was the first one I came across. Some carousels have been damaged over time that only the seats were intact. There were also vintage carnival games. And a bicycle carousel .. Among the attractions, which come from the collections of Francis Staub and Regis Masclet, is a bicycle carousel from the late 19th century – one of only two in the world that were created in Paris to encourage the use of what was then the new mode of transportation – the bicycle. The rides were so fascinating, I made a collage of some of the unique seats. It was so much fun to see the rides, hopefully I can go back before Governors Island closes for the season. On my way to the ferry to go back to Manhattan, I saw this drawing on the street. Cool! Makes you want to run all the way to the rides and hop on one of the vintage seats. That was a very enjoyable and informative City of Water day celebration, with a bonus of vintage carousels from Fête Paradiso. I hope to join again in next year's festivities. This summer and on through fall, thirteen large metal sculptures by Albert Paley will grace Park Avenue. It is another project presented by the Fund for Park Avenue's Temporary Public Art Collection and the city's Department of Parks and Recreation. Albert Paley is the first metal sculptor to receive the coveted Institute Honors awarded by the American Institute of Architects, the AIA’s highest award to a non-architect. I've written about two previous art exhibits on Park Avenue. In the Spring of 2012, Park Avenue had Rafael Barrios, and after that, in the Summer it featured Niki de St. Phalle. Last Spring, it was Alexander Arrechea, I haven't written about it but took pics of all the sculptures for the project No Limits. All their creations were massive and eye catching, and the same holds true for Albert Paley's sculptures. Near East 52nd Street flanked by the Seagram Building on the east and the Racquet and Tennis Club on the west, along the street median, lies the first artwork, the largest of the thirteen sculptures. WXXI has an in-depth coverage of Albert Paley's work. After each pic of the sculpture, I will link on the artwork's title WXXI's spotlight page which includes a short description of the sculpture, a video, as well as Paley's sketches. The sculpture above is Progression. The next sculpture is a burst of autumn colors, and one surprising royal blue feature standing out. Each sculpture has a sign showing its name and the materials used. The artwork above is called Between the Shadows. Walking further, I looked back at the Helmsley Building on 46th Street and had this view of Park Avenue. At 54th Street is a tall beauty in silver. I think the buildings behind greatly complement the sculpture. The artwork is aptly named Reflection. At the end of this continuous block of median is Paley's fourth sculpture in the series. I like the contrast of the straight and wavy lines, as well as the dark and light colors. The piece is called Encore. Then just across the street, at the start of another median is a show of red. It looks like playful piece, maybe that's why it's called Jester. The afternoon sun was reflecting on the buildings along the street. I think Park Avenue has one of the best architectures in the city. The next sculpture is an all brown piece along 58th Street. Why do I feel like I'm looking at the back of a cute cartoon mouse? Maybe because one of parts looks like a tail? Is this why this piece is called Counter Balance? Hmm .. The view looking west from Park Avenue and 58th Street. You can see One57 Building which is still under construction. Upon completion, it will be the tallest residential building in the Western Hemisphere. Albert Paley's seventh sculpture in the series is another silver piece but this time much wider. There are lots of different and contrasting angles on this piece, which is titled Variance. The next three sculptures are all-brown pieces. After Variance comes this sculpture that looks like it's somewhat leaning. It's aptly called Tilted Column. The next piece is a somewhat straighter version of the previous one, in fact it looks like the two sculptures have the same base. This piece is called Ambiguous Response. On the above pic at the right of the sculpture is Christ Church. I had the chance to take some pictures of its beautiful interior a few months ago. You can see them on my flickr album, Along Park Avenue. The tenth sculpture in the series looks like a column surrounded by wavy lines, some wide while some are very narrow strips. The sculpture is called Cloaked Intention. Here's a closer look at some of its features. On my way to the next sculpture, I happen to look up at the buildings and saw this. Four different structures looming up the Park Avenue skyline. I think a good caption would be The Four Towers, what do you think? The next sculpture lies on the street median near the beautiful Central Presbyterian Church. Another fitting title for the piece, it's called Composed Presence. Here's a closer look. A little bit further along near the south end of the Park Avenue Armory is the twelfth sculpture in the series. The piece is called Languorous Repose. Here's a close-up of some of it's details. You can clearly see Albert Paley's name etched on the piece, as well as the year it was made. The last and thirteenth piece in the series was glowing gold in the afternoon sun. Called Envious Composure, it stands out at the median by the north end of the Park Avenue Armory. WXXI has an extensive coverage on Albert Paley on Park Avenue, a total of six episodes. It is a behind-the-scenes story of what it takes to complete such a significant project. Shot in high-definition, viewers will see firsthand the creation of the 13 sculptures and will learn the story behind them. “This is the most ambitious project that any sculptor in the last decade of this program has come up with,” explains Patterson Sims in the first episode. Sims serves as a member of the Sculpture Committee for the Fund for Park Avenue. In the Web series Paley and his team talk candidly about the work involved in this endeavor and the challenges they faced. WXXI.org/paleynyc also offers extended looks at each individual piece being created, photos from the studio, and social media links for more in-depth information and background. "No matter how good a sculpture is," said Mr. Paley, if it doesn't amplify the space it doesn't function." For the rest of my Albert Paley on Park Avenue pics, here's the album on Flickr - Paley on Park Avenue.